Three Miami Dolphins kneeled during the national anthem in London. camera (Paul Childs/Action Images via Reuters) Miami Dolphins players kneel before the U.S. national anthem was played ahead of an NFL football game against New Orleans Saints at Wembley Stadium in London, Oct. 1, 2017. 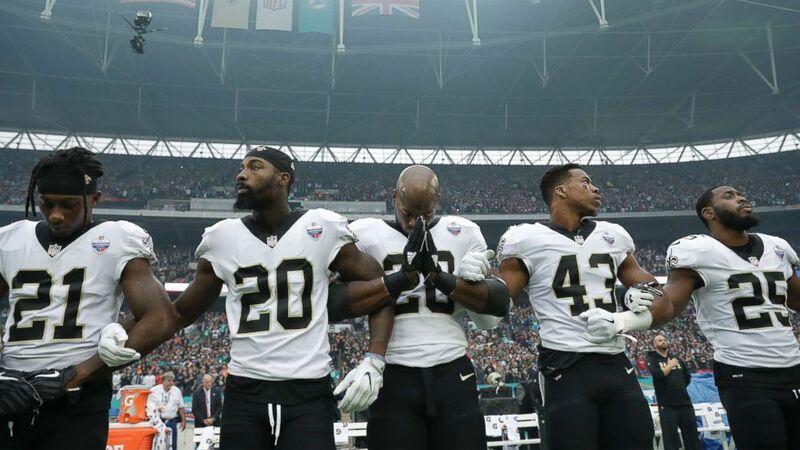 Players for both the Miami Dolphins and New Orleans Saints took a knee on the field today during the opening moments of a football game on Sunday in London, the day after President Trump tweeted that it is “very important” that players stand up for the playing of the national anthem. 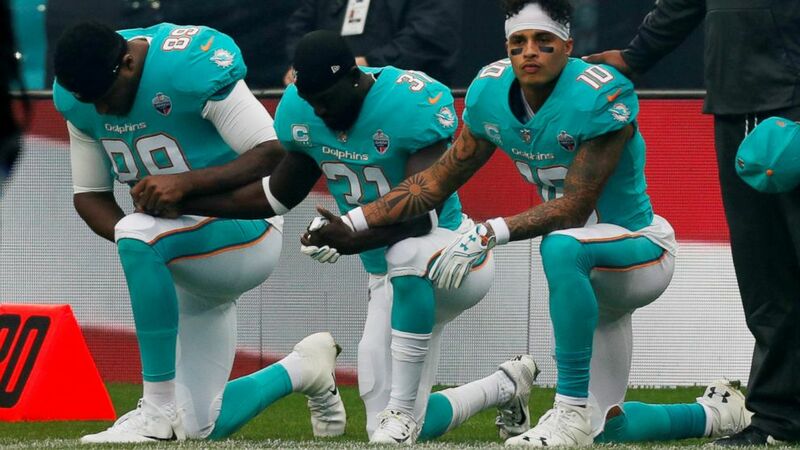 Dolphins receiver Kenny Stills, tight end Julius Thomas and safety Michael Thomas took a knee for the United States national anthem. Afterwards, along with every other player on the team, they stood up for the playing of the United Kingdom national anthem, "God Save the Queen." Across the field at the game at Wembley Stadium, the entire New Orleans Saints team took a knee for a moment, then rose as a group as "The Star-Spangled Banner" played. The decision by the Saints appeared to follow the Dallas Cowboys’ lead. On Monday night, before “America’s Team” competed against the Arizona Cardinals, the players and their owner, Jerry Jones, displayed their own version of unity by kneeling on the field before rising as a group prior to the playing of the national anthem. The move is a departure from the actions of dozens of NFL players who have deliberately been kneeling during the national anthem in defiance of Trump's public scoldings over the silent protests, which began over a week ago and haven’t waned. (Tim Ireland/AP) New Orleans Saints quarterback Drew Brees (9) kneels down with teammates before the U.S. national anthem was played ahead of an NFL football game against Miami Dolphins at Wembley Stadium in London, Oct. 1, 2017. Saints players then stood when the anthem was played. The kneeling protests began in the preseason of 2016, when former San Francisco 49ers backup quarterback Colin Kaepernick began kneeling during the anthem in response to police killings of black Americans. This season, numerous professional, college and high school athletes have picked up the silent protest. 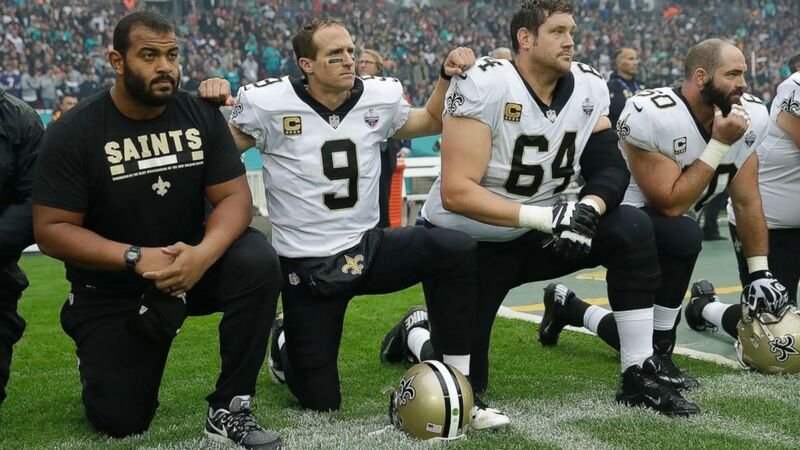 The Saints and Dolphins’ protest took place on the fourth week of the football season, and a day after the president reinforced his stance that NFL players should "stand" while the national anthem is performed. Later in the day in the U.S., Oakland Raiders star running back Marshawn Lynch arrived at Denver’s Mile High stadium to take on the Broncos in a black T-shirt that read: "EVERYBODY VS. TRUMP." The imbroglio between the NFL and the president began on the evening of Sept. 22, when Trump was in Huntsville, Alabama to stump for GOP senatorial candidate Luther Strange. In his off-the-cuff speech Trump hit any NFL player who decide to take a knee while the national anthem is performed. "Wouldn't you love to see one of these NFL owners, when somebody disrespects our flag, to say: 'Get that son of a b---- off the field right now, out. He's fired. He's fired," the president said to the crowd. A day later, Trump extended his anti-protest message by taking shots at the league's commissioner, Roger Goodell, tweeting that he is "trying to justify the total disrespect certain players show to our country." Trump then attempted to threaten a boycott if players did not standing during the national anthem. The president wrote, "you will see change fast" -- suggesting fans would boycott games. (Tim Ireland/AP) New Orleans Saints running back Adrian Peterson, center, prays as he and teammates lock arms as they stand for the U.S. national anthem ahead of an NFL football game against Miami Dolphins at Wembley Stadium in London, Oct. 1, 2017. Since, the fallout by the league has been widespread. Week three of the season saw hundreds of players, coaches, and owners come out for “unity” by kneeling, locking arms in solidarity, or remaining in the locker room during the national anthem.